Maybe a better title would be: if you’re gonna steal an image, do so properly because if you leave it on my server, you’re giving me the power. And honey, I will use it. Here’s the skinny: I actually read my server logs. All of them. Not leisure time reading, but in serious geek moments -- and when I’m not dicking around on FaceBook -- I give them a going over, see who’s going where and where they’re coming from. So yesterday, I noticed something I’d previously overlooked: an image had been being pulled from January Magazine for months. Just an image without a story. I rubbed my palms together gleefully. Such things always mean some fun. We have run a lot of original photographs at January over the years and there have been a lot of thefts. I blogged about them in this space last year. When it’s a magazine or newspaper -- on the Web or in print -- we just fire off an invoice and most of the time we even get paid. But this was a blog and we were serving it, so it meant we didn’t have much hope on financial compensation. It also meant I could do what I liked. So here’s what I did: the blog in question had taken the piece of art we had built -- my partner David took the photo of Salman Rushdie and designed and executed the accompanying art for the interview we did with him in 2002. 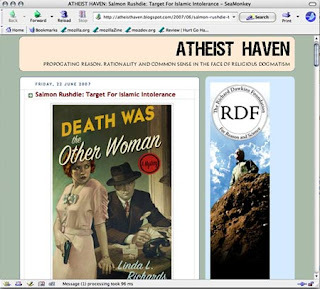 The blog had lifted this artwork intact and plopped it onto a page to illustrate an actually quite thoughtful piece on Salman Rushdie as a target for Islamic intolerance. I went into the January servers, renamed the piece of art (so it would read properly on January), then took the a jpg of the cover of my upcoming book and resaved it under the name that had originally been assigned to the Rushdie art. Then I uploaded the whole shebang to our servers. Since we’re running a link to the newly sabotaged piece, it seems likely that someone else will notice this on their server logs and correct stuff. But in the meantime, if you follow this link, you will see the beautiful cover of my new book illustrating a piece to which it brings absolutely no meaning. However, the people there were using something that is mine for free and are for the moment paying for it with an ad for my book. So there. OK so, realistically, nothing very much is accomplished with this whole exercise beyond my own amusement. Sometimes, however, that’s really quite enough. And the amusement of at least one other person now. Hey, hey! We gets our smiles where we can take 'em, oui? It appears they've fixed it now. I once caught someone stealing a graphic from me (a narrow black line, of all things), and replaced it with a jpg that read "Help me! I'm a stolen graphic!" It was some kid's blog. I have no idea if they ever saw it before I turned the hot linking off on my website. You're right, Pepper: it's been fixed. No note on where the new image came from, though. (But I'm guessing they didn't run out with their Nikon and say, "Salman! Baby! Stand right here." The image has, however, been uploaded to Blogger, so I guess they learned that part of the lesson, anyway. Didn't know you were pissed. I actually didn't realize you were actually making that much of a fuss over a pic. Anyway, I am a fan of Rushdie, and if I did upset you I apologize. Dude: that wasn't the sound of me being upset. That was the sound of me laughing at your expense. A subtle difference, I know. But real.